Annually, the ERM Initiative in the Poole College of Management at North Carolina State University, in conjunction with global consulting firm Protiviti, surveys boards of directors and C-suite executives about risks on the horizon for the upcoming year. 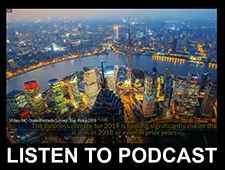 The most recent report, 2019 Executive Perspectives on Top Risks, highlights top risk concerns on the minds of executives for 2019. Boards and C-suite leaders across the globe are most concerned about their organizations’ ability to transform their operations and infrastructure so they can compete with organizations that are “born digital.” Succession challenges, followed by heightened regulatory change and scrutiny, round out the top three concerns. The survey report – the seventh annual such research report – assesses the concerns of 825 board members and executives globally, across a variety of industries. This year’s respondents indicate that the global business environment is somewhat riskier in 2019 compared to previous years. The survey results also suggest that corporations are likely to increase investment in strengthening risk identification and management efforts over the next twelve months relative to the prior year. In particular, respondents indicate a significant increase in concerns related to their organization’s digital readiness, jumping from the number ten position in 2018 to number one in 2019. The risk of succession challenges and the ability to attract and retain talent moved to number two, triggered by a tightening labor market and an increasing need for specialized digital knowledge and subject-matter expertise. Regulatory changes and heightened scrutiny continue to represent a major source of uncertainty, while concerns about economic conditions fell out of the top ten list of risks for the first time we have conducted this study. 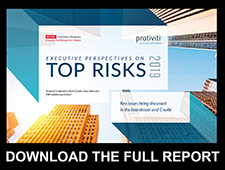 The 2019 Executive Perspectives on Top Risks survey was conducted in the fall of 2018, and respondents represent organizations across the globe in the public and private sectors. Sixty percent of respondents’ companies have annual revenues of $1 billion or more. The survey report provides detailed insights broken out by size and type of company, respondent role, industry and geographical region. 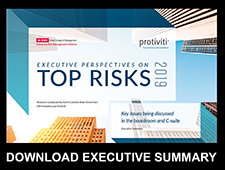 In addition to the full report, 2019 Executive Perspectives on Top Risks report from Protiviti and North Carolina State University, you may also download an Executive Summary and Infographic at the links below. A podcast highlighting the key results is also provided below. Jump start 2019 and register for our upcoming workshops and conferences. 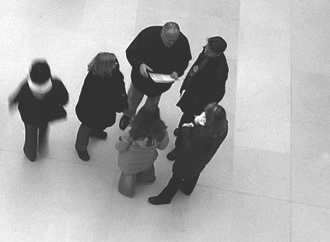 For a list of current ERM events, click here. A complimentary 60-minute webinar exploring the implications of the survey results will be held on December 12 at 2:00 p.m. EST, featuring NC State’s Dr. Beasley and Protiviti’s JimDeLoach and Pat Scott.